Counsel the High King and recommend a true leader for Rivenspire. Now that the threat to Rivenspire has been dealt with, there's still the matter of crowning a true ruler for the region. Talk to High King Emeric in Shornhelm. Talk to Baron Alard Dorell and Countess Eselde Tamrith. Provide a recommendation to the High King. After witnessing Verandis Ravenwatch remove the Lightless Remnant from Nirn, return to Shornhelm Castle. 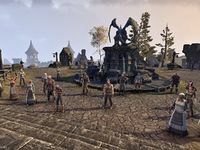 There, you will be greeted by a number of citizens and nobles of Rivenspire, including Darien Gautier, Skordo the Knife, Countess Eselde and Lady Aurine Tamrith, Baron Alard Dorell and Queen Maraya. Depending on your previous actions, the attendants may include Heloise Menoit and Lieutenant Fairfax, Arlie, Allan, and Krisandra Edrald, Dulkhi and/or Federic Seychelle, Constable Agazu, and Captain Janeve Tamrith. Standing in front of the thrones is High King Emeric. Talk to Emeric and he will tell you that with the Montclair threat gone, he needs to choose a single noble to rule Rivenspire, either Baron Dorell or Countess Tamrith. He asks for your counsel on the matter, and suggests you talk to the two candidates before making a decision. Talk to the two possible rulers to hear why they think they should be chosen over the other. Countess Tamrith will tell you that while she thinks the Baron is good man, he is "dangerously short-tempered" and "far too quick to act". Her first priority if crowned queen will be to "[help] the people of Rivenspire recover". Baron Dorell will tell you that while he respects Countess Tamrith, she lacks the "decisive leadership" and "firm hand" required to rule Rivenspire. He says that his first priority as king will be to rebuild Rivenspire's defenses and recruit new members of the guard. Make your decision and inform High King Emeric. Jeremy Sera, Lead Content Designer for ESO, revealed on 23rd June 2016 that they designed the cameos in this quest with the idea that everyone you've helped in Rivenspire would "show up as a sort of ewok party". Hidden Objective: Hidden; Talked to Emeric Already?